One of the most important things you can do for your business social media accounts is create a game plan and stick to it. Creating a social media content calendar ahead of time ensures that you have a constant stream of relevant content posting on your channels. This helps keep your customers engaged and excited about your brand. While content calendars sound great in theory, it can be tricky to figure out how to fill up every day with new and interesting material if you don’t have experience in social media management. Our Social Local team at VitalStorm has countless creative ideas that we use to fill up our clients’ content calendars each month. 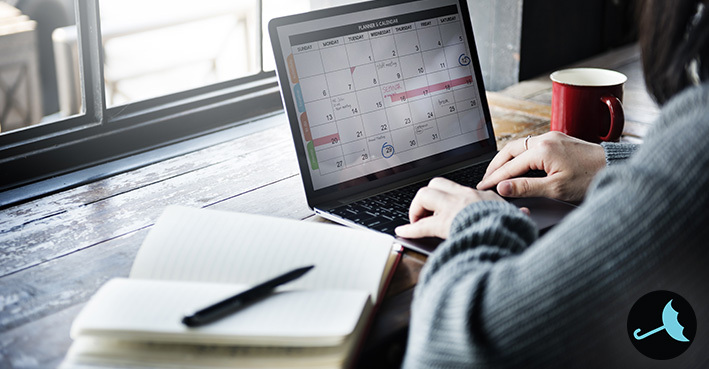 Here are 12 social media content calendar ideas from our team to help you start brainstorming engaging content for your business. One thing that all of your followers have in common? They love genuinely useful information. If they are interested enough in your brand to be following your account, they will appreciate industry tips that apply to them. You can share helpful blog posts with instructional guides, or even simply graphics with short, fun facts about your industry. Aside from well-known national holidays like Valentine’s Day or Independence Day, there are plenty of industry-specific and random wacky national holidays. Check out websites like National Day Calendar for opportunities to celebrate everything from pancakes to puppies in your social media posts. You shouldn’t use social media as a chance to talk at your followers and customers: you should use it as an opportunity for igniting conversations. Pose an interesting question that sparks communication between your brand and your followers, emulating a human relationship. 4. Discuss a trending topic. If you join your followers in discussing topics that matter to them, they will remember your brand when it is time to spend money on a product or service. Make sure you only engage in trending topics in a way that is authentic to your brand voice, and be careful not to say anything too polarizing that might risk alienating some of your customers. For more information about how to use trending topics in your social media strategy, check out our blog post. Do you have a particular product that you recommend to every customer? Highlight the reasons why you love it in a photo or video clip on your social media channels. Next time your business receives an outstanding five star review, screenshot it or copy and paste it into a colorful graphic. Share it with your followers to build trust and remind them that you prioritize customer service. 7. Share an inspirational quote. Motivational or funny quotes make some of the most popular social media posts because people feel like they can relate to the content. Add #MotivationalMonday to your content calendar line up or share funny quotes that relate to your industry occasionally. 8. Advertise a discount or promotion. While your social media pages should not look like gigantic ad spaces for your business, you can use them to promote specific offers and discounts. If you frame your posts as helpful and informational instead of overly promotional, they will appeal to your followers better. Remember to follow the 4-1-1 rule with your posting schedule: for every self-promotional sales post you make, follow up with four engaging pieces of content and one repost from another source. Keeping the ratio of strictly sales-driven posts lower than fun or informational posts helps to boost engagement from your followers. 9. Offer a giveaway contest. One universal truth you can rely on in your marketing strategy is that people love free stuff. If you are hoping to improve participation from your follower base before you launch a new promotion, offer a giveaway contest. This will help widen your brand exposure and encourage your existing follower base to engage with your brand. 10. Create a funny meme. Hoping to reach a wider young adult audience? Your meme game needs to be strong. Take an existing popular internet meme and add text that applies to your industry in a funny way. Your followers will laugh, and your brand name will become more relevant to them. 11. Share a behind-the-scenes photo. Much like informational tips, behind-the-scenes content gives your followers insight that can only come exclusively from your business’ expertise. Snap a quick photo or video of a favorite product or a particular service your employees provide to customers every day. Adding industry news to your content lineup is an easy and efficient way to keep your followers informed and interested. By providing them with information that applies directly to their lives, you will establish your brand as an industry expert and a source of helpful content. This can translate to increased trustworthiness that helps you generate leads. We hope these social media content calendar ideas help you get creative. If you are struggling to find the time to create engaging content on behalf of your brand, let an experienced social media strategist generate a content calendar for you. Contact us at VitalStorm today! Our Social Local team at VitalStorm creates unique content calendars tailored to each of our individual clients and maintains regular engaging posts that improve brand recognition. If you want to reap the benefits of a strong social media presence for your business, give us a call at 877-311-5695. To learn more about how your business can benefit from social media strategy, check out our free eBook, Social Media Marketing for Home Services.